Wally Backman was perhaps the first major-league manager fired before his team played a game. His fiery personality may have cost him another chance at managing in the majors. Three times he spent short stints in jail. He declared bankruptcy. From this sordid interval in life, he emerged to become a successful minor-league manager. Backman was drafted 16th overall in the 1977 June amateur draft out of Aloha (Oregon) High School. He was assigned to the Little Falls Mets of the New York-Penn League. There, Backman played in all but two of Little Falls’ games in 1977, mostly at shortstop. The 17-year-old led the team in most offensive categories, including at-bats (255), runs (44), hits (83), stolen bases (20), and batting average (.325). 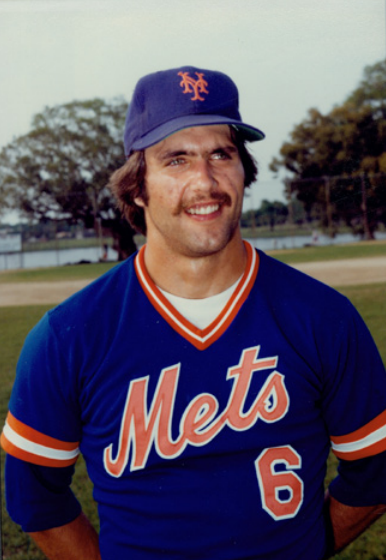 Backman continued his ascent in 1978, playing for the Lynchburg Mets of the Class-A Carolina League, where he helped lead the team to the league championship. He played the entire season at shortstop, and again showed off his offensive skills. Backman led the team in at-bats (494) and runs (86), and was second on the team with a .302 batting average. His speed was on display as well; he led the team in stolen bases (42) and triples (9), but his 99 strikeouts were the third most in the league. Backman’s fielding, however, was of concern. He had a .947 fielding average at shortstop and led the team with 30 errors. Despite the shaky fielding, the Mets promoted Backman to Jackson of the Double-A Texas League, most likely due to his offense and ability to get on base at a nearly .400 clip. Backman’s 1979 season was his first facing some challenges. His offensive numbers dipped, but he was still second on the team in runs (63) and led the team with five triples. Once again, his defensive skills were subpar: 30 errors with a .933 fielding percentage. The Mets still liked what they saw offensively from Backman, enough to promote him to Triple-A Tidewater for 1980. The organization had a plan. Backman was switched to second base. In his limited action at shortstop that season, his fielding percentage was .931 but in games at second, it jumped to .965. His skills on offense became sharper. He was among the team leaders for most offensive categories. When the Mets made their September call-ups, Backman was on the list, and was immediately thrown into the fire. Mets second baseman Doug Flynn had fractured his right wrist on August 20, paving the way for Backman to play.3 Backman played in 27 of the Mets’ remaining 32 games, primarily at second. His fielding was stellar—only one error—and he batted .323 with a.396 on-base percentage, better than any of the Mets regular starters. Backman’s 1980 call-up and 1981 spring training earned him a spot on the 1981 Mets as a reserve infielder.4 He played in 26 games, mostly as a pinch-hitter, before the Mets sent him back to Tidewater on June 8, just days before the players elected to strike. Backman was upset by the demotion and the lack of steady playing time.5 He played in only 21 games for Tidewater before tearing his rotator cuff. Backman missed the rest of the 1981 season while rehabbing the injury. In 1984 Backman started 108 games at second for the Mets, batted .280 and made only 10 errors at second base. For the first four months of the season, Backman platooned with Kelvin Chapman. When Chapman was sent down to the minors, Backman was given the job full-time job and he performed well offensively and defensively.17 The 98-win Mets finished in second, three games behind pennant winner St. Louis in the NL East. Spring training did nothing to clear up the competition at second. Backman entered the season platooning with Teufel, playing against right-handed pitchers.21 He rose to the challenge, batting .320 as the Mets took first place on April 23 and never gave up the position. Backman played in 12 of the 13 Mets postseason games, batting.238 in the NLCS against Houston, and .333 in the World Series. Backman had two solid seasons platooning for the Mets. However, the team wanted to give one of its top prospects, Gregg Jefferies, a chance at second so Backman was put on the trading block again, and in December 1988 he was traded to the Minnesota Twins for three minor-league pitchers. In 2013 the Mets switched their Triple-A affiliation to the Las Vegas 51s of the Pacific Coast League. Backman led the team (81-63) to a first-place finish, but lost in the playoffs to Salt Lake. In 2014 they finished first again with the same 81-63 record. Despite losing in the playoff semifinals again (this time to Reno), Backman was named PCL Manager of the Year. In 2015 the 51s missed the playoffs. Backman also had a hand in the Mets’ success in 2015. Three pitchers who played important roles in the team’s march to the World Series, Matt Harvey, Steven Matz, and Noah Syndergaard, as well as infielder Wilmer Flores, all played for Backman in the minors. Through the 2015 season, Backman had a 422-369 record while managing in the Mets organization. 1. Jeff Pearlman, “Three Years Later, Backman Still Trying to Get to the Bigs,” ESPN, sports.espn.go.com/espn/page2/story?page=pearlman/071022 (accessed December 1, 2015). 3. Joseph Durso,”Mets Lose 7th in Row; Flynn Idled 2-6 Weeks,” New York Times, August 21, 1980. 4. Joseph Durso, “Leary Earns a Place on Mets Roster and Will Face Cubs Sunday,” New York Times, April 6, 1981. 5. Thomas Rogers, “Baseball Notebook: Mets’ Backman Expands Strike,” New York Times, June 16, 1981. 6. Murray Chass, “Mets Trade Flynn; Expos Get Taveras,” New York Times, December 12, 1981. 7. Jane Gross, “Met Plan: Versatile Infield,” New York Times, February 24, 1982. 8. William C. Rhoden, “Backman Fills Gap for Mets,” New York Times, July 12, 1984. 10. Joseph Durso, “Stearns on Disabled List, Seaver Ailing,” New York Times, March 28, 1983. 11. Gerald Eskenazi, “Mets Try 5 Players in Double-Play Role,” New York Times, March 21, 1983. 12. Joseph Durso, “Second Base Is Puzzling Mets,” New York Times, March 3, 1983. 13. Joseph Durso, “Strawberry’s 3-Run Homer Paces Mets,” New York Times, May 18, 1983. 16. Lawrie Mifflin, “Backman Stays In Mets’ Plans,” New York Times, December 21, 1983. 17. “Backman Responds to Full-Time Duty,” Chicago Tribune, August 1, 1985. 18. Joseph Durso, “Backman Facing Challenge At Second Base,” New York Times, February 25, 1986. 20. Murray Chass, “Backman Loses Case to Mets,” New York Times, February 20, 1986. 21. Michael Martinez, “Backman is Facing Another Battle,” New York Times, March 30, 1986. 22. Murray Chass, “Mets Give Backman a $2 Million Pact,” New York Times, January 22, 1987. 23. Johnette Howard, “Strawberry’s Latest Strikeout May Be Last,” Washington Post, April 14, 1994. 24. George Vecsey, “Baseball, Everybody, Baseball,” New York Times, June 2, 1989. 25. “Braves Jettison Backman for Cabrera,” New York Times, April 2, 1993. 26. Filip Bondy, “Arachnophobia: Spider Bite Adds to Backman’s Web of Miserable Luck,” New York Daily News, May 24, 1998. 28. Jack Curry, “Backman Named Arizona’s Manager,” New York Times, November 2, 2004. 29. Lee Jenkins, “As Mets Look Ahead, They Look Back,” New York Times, September 23, 2004. 30. David Waldstein, “Mets Will Hire Backman to Manage In Brooklyn,” New York Times, November 14, 2009. 33. Jack Curry, “The Past Costs Backman His Job, Four Days After He Received It,” New York Times, November 6, 2004. 34. “Sports Briefing,” New York Times, December 4, 2004. 36. Jack Curry, “Backman Ready for His Show of Shows,” New York Times, June 17, 2007. 40. Ben Shpigel, “After 5 Years, Backman Gets a Second Chance,” New York Times, November 18, 2009. 42. David Waldstein, “Mets Choose the Intense Collins as Their Manager,” New York Times, November 22, 2010. 43. Hunter Atkins, “A Long Road Home, With Further Still to Go,” New York Times, June 17, 2012.